“Our small congregation met in the same Odd Fellows Hall from the late 1930s through 1959, or almost the entire 28 years my grandfather served as branch president. For many of those early years when my mother was growing up, the Aurora Branch of the Church of Jesus Christ of Latter-day Saints had more words in its official name than members in the congregation, but when my memories begin we had about 40 regulars. 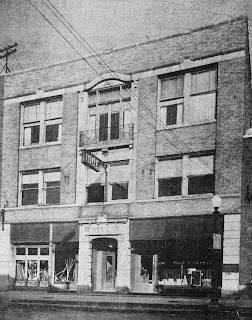 “The lodge hall occupied the second and third floors of a commercial building at 62 South LaSalle Street, one block east of Broadway in Aurora, Illinois. Wedged between the Schorr Glass Company and the Lindsay Water Softeners store, its double-door entrance was flanked by pretentious square pillars, whose indentations regularly enticed boys—but never girls—to climb up them when they should have known better than to rough house on Sundays. The second story meeting rooms were reached by a staircase that looked tall enough to lead all the way to heaven right then and there, but it lacked the glory of Jacob’s ladder. Poorly lit and dingy, the steep stairs proved to be a weekly trial for older folks who needed to rest on the landing halfway up and sometimes resorted to pulling themselves hand over hand along the railing before they reached the top. “As people gathered at 10 a.m. for Sunday School and again at 6:30 p.m. for sacrament meeting, the high ceilings and bare wooden floors in the long, narrow room on the left of the stairs echoed with friendly greetings and the sound of children’s feet. Directly across from the door hung a large American flag, and next to it a banner for the I.O.O.F embroidered with a linked chain and other symbols, including appropriately enough, an enormous peering eye of God.